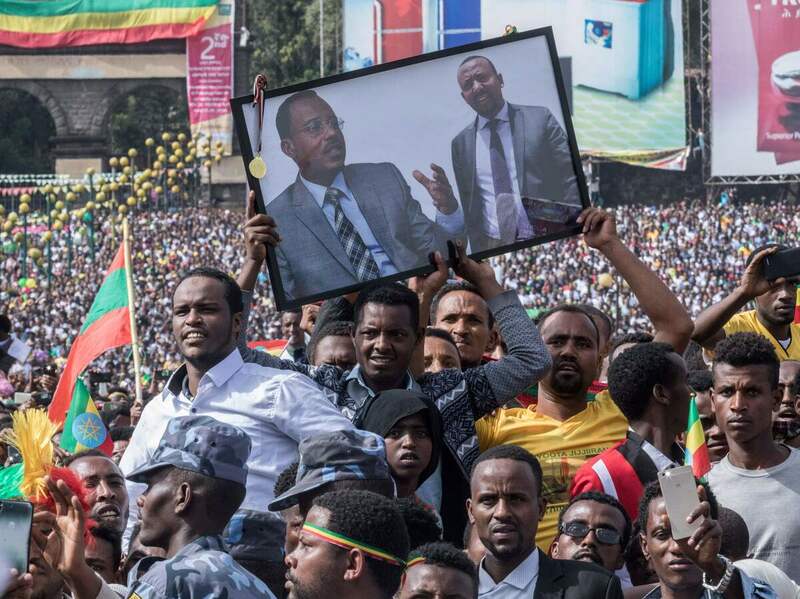 Grenade Attack Tears Through Rally For Ethiopian Prime Minister Shortly after Abiy Ahmed addressed a massive rally in the capital, Addis Ababa, a blast sent attendees running. Authorities say at least one person died in the attack and its aftermath. Thousands of Ethiopian Prime Minister Abiy Ahmed's supporters gathered to watch him speak at a rally Saturday in Addis Ababa. But a blast interrupted the event, leaving at least one person dead and dozens more with injuries. At least one person died and scores more were wounded in the explosion and its aftermath. Of the more than 150 people who sustained injuries, eight remain in critical condition as of Saturday night local time, according to the country's minister of health. The prime minister, for his part, emerged from the attack unharmed. "We will overcome hate with love. Some whose heart is filled with hate attempted a grenade attack," Abiy's chief of staff, Fitsum Arega, said on Twitter, adding: "The perpetrators will be brought to justice." Authorities have not clarified who, exactly, they believe those perpetrators to be. Speaking to the country not long after the rally, Abiy referred to the attackers as "anti-peace forces." "You need to stop doing this," he said, directing his remarks at unnamed perpetrators. "You weren't successful in the past and you won't be successful in the future." Footage of the explosion and its aftermath surfaced soon afterward, depicting scenes of panic rippling the crowd immediately after a loud pop sounds in their midst. A camera had been trained on Abiy, too. In the video, the premier is seated on stage after his speech listening to the next speaker, when the blast sounds and stirs confusion among Abiy and the people surrounding him. Soon, members of Abiy's security detail appear to realize the situation and hastily usher him to safety. The rally's organizer, Seyoum Teshome, told The New York Times he believes the prime minister was the attack's target, "because the suspect was aiming to throw the grenade by the right side of the stage, where he was sitting." He said it was the intervention of people around the attacker that disrupted the assassination attempt. Most of the victims sustained their wounds "not due to the grenade, but rather it was the stampede, it was just running away from that spot," Seyoum told Agence France-Presse. Abiy has not been in power long, having only ascended to the premiership in April when the country's ruling coalition reluctantly — after much jockeying — gave in to nearly nonstop protests. For the past three years the coalition, a collection of ethnically aligned parties, had been facing mounting dissatisfaction with government corruption and its authoritarian policies. So they turned to Abiy to try to quell the unrest. Though technically part of the ruling coalition, Abiy nevertheless had come to represent the views and demands of the opposition. And as an Oromo, a member of an ethnic group that felt marginalized by the minority Tigrayans who controlled much of the government, Abiy's very profile represented something of a sea change in Ethiopian politics. And since taking power, he has wasted little time implementing an agenda of rapid change in a country that for years had stifled dissent. He released political prisoners, lifted a state of emergency and said earlier this month that his government would fully accept a peace agreement with neighboring Eritrea that had languished for years. Eritrean ambassador Estifanos Afeworki, reflecting the eased tensions between the countries, said Saturday that his country "strongly condemns the attempt to incite violence" at the Addis Ababa demonstration. But all has not been smooth for Abiy. The Tigrayan faction of the ruling coalition has begun to oppose some of his reforms. And the violent disruption of Saturday's massive rally — which had been organized in the first place to show off Abiy's widespread support — signals that perhaps a tense power struggle still seethes beneath the surface. The U.S. Embassy in the Ethiopian capital made clear on Saturday that it supports Abiy's moves. It condemned the attack in a tweeted statement, asserting that "violence has no place as Ethiopia pursues meaningful political and economic reforms." Meanwhile, Abiy spent his evening visiting victims in the hospital. "He told them they represent the true spirit of love, forgiveness & togetherness," Fitsum, Abiy's chief of staff, said Saturday. "They all are our inspiration, our courage & a true reminder of what is good in us."